My own personal office dress code is shirt-and-tie equivalent. My boss wears a button down shirt, dress pants and a tie to the office every day. Occasionally his attire includes a suit jacket. So where does that leave me? Dressy separates (in multiple layers) with no sandal-style shoes, essentially. Here’s my go-tos for summer work wear. I have a year-round uniform (I use that term loosely, in the wardrobe sense, not in the conscripted sense) that makes my office wear mix-and-match. It’s based on three silhouettes that I love. Cropped pants, heels and a blouse. 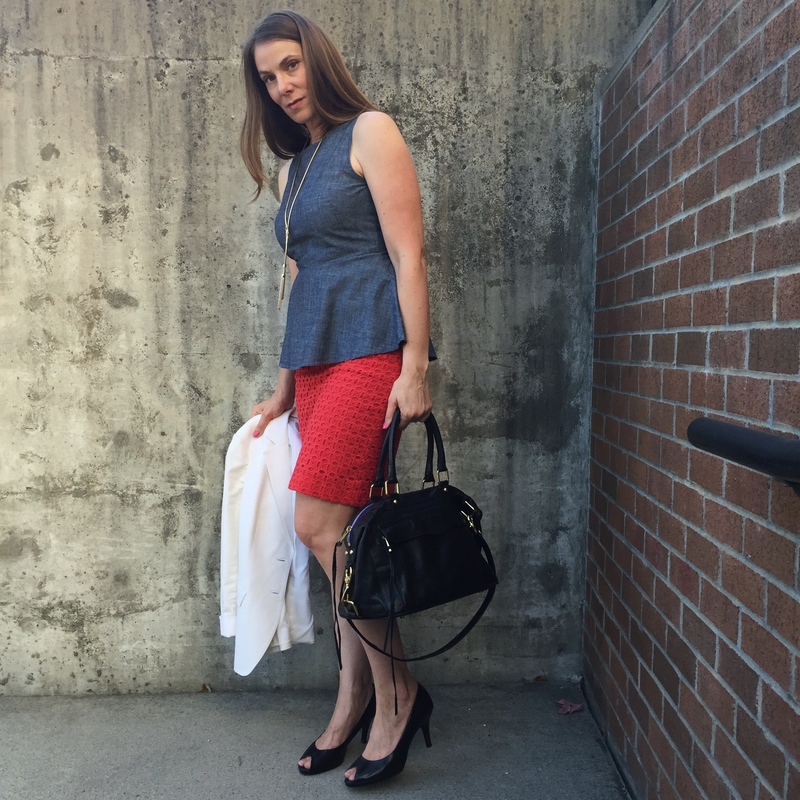 Pencil skirt, top and blazer. Men’s style trousers, top and cardigan. But by the time our west coastal summer heat hits, I’m a little bored with what I’ve been wearing. I’m not about to completely overhaul my closet to manage the heat. However, I will mix things up within my own closet. I use the same pieces worn in a way that works for my car’s aircon blast and for my office’s big sun-facing windows. Loose tops with mini-sleeves play a big role in my summer work wear. You might call them sleeveless, but they do cover at least a little of my shoulder. This version of a shirt goes well under summer-weight cardigans and light blazers. As my office air-conditioning struggles to manage the sun’s rays, I can slip off my completer piece as needed. I have a few pieces made of fabrics that primarily read as “summer”. A pencil skirt fashioned in eyelet lace is certainly one way to get the feeling of summer into my daily grind. 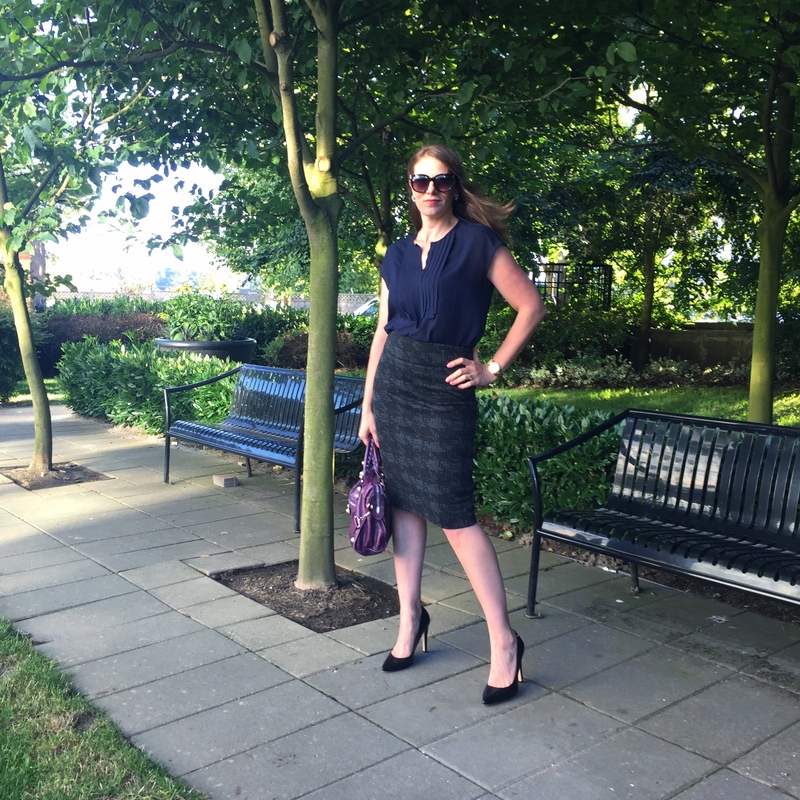 The classic pencil skirt shape doesn’t compromise the formality of my summer work wear. 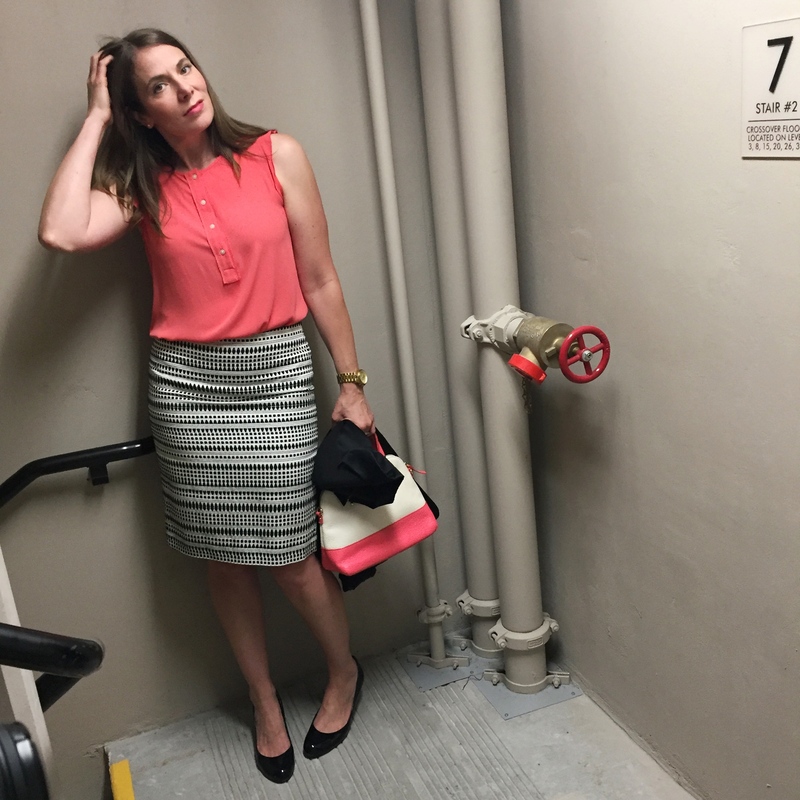 I also have this flax/linen-look pencil skirt with athletic stripes at the sides and back. I love it for the summer, as it just doesn’t look quite right in the colder months. Colour factors into my summer work wear. While I love fuchsia and wear it all winter long, sorbet colours feature prominently in my warm weather work attire. Brights are a great foil for neutrals. I will tend to wear less black and grey, favouring whites, taupes and khakis in the hot months of the year. The Joy of Style is all about helping you with your wardrobe mix-and-match, all year long. Contact us to book your end-of-summer wardrobe remix today. Follow our antics on Facebook, Instagram, Pinterest and Twitter.